Côte d'Amour (Love coast) is the coast of the Guérande Peninsula, in the north of the Loire estuary. 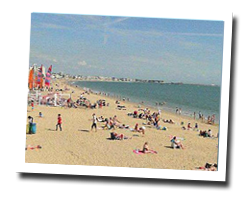 At the seaside you can find a rocky coastline, south-facing sandy beaches and famous seaside resorts such as La Baule, one of the most famous French seaside resorts. It is a lively destination all year long. On the Côte d'Amour enjoy a seaview holiday rental. In Saint Marc sur Mer, between La Baule-Pornichet and Saint Nazaire, in a traditional building completely renovated in 2015, on top of a beautiful family beach (direct access), facing south, sea views. Apartment Type 3 71 m², with a 30 sqm terrace and private garden, for 4 to 6 people. 2 Bedroom(s), 1 double bed(s). Final cleaning : 50 €. Price from 650 € to 900 €. Studio flat Facingthe beach , in a residence located on the seafront with direct access to the thalassotherapy center Daniel Jouvance. residence with lift. balcony with outdoor furniture. Sheets provided. laundry. 0 Bedroom(s), 0 double bed(s). short stays possibility. Final cleaning possibility. Price from 350 € to 1100 €. Studio flat Facing the beach , in a residence located on the seafront with direct access to the thalassotherapy center Daniel Jouvance. residence with lift. balcony with outdoor furniture. Sheets provided. laundry. Price from 350 € to 1300 €. 2 rooms apartment 48 m2 in a residence. Terrace with outdoor furniture. Nice View of the sea and the port. 1 Bedroom(s), 1 double bed(s). short stays possibility. Final cleaning : 50 €. 4 rooms house 105 m2. Terrace, garden with outdoor furniture and barbecue. View of the sea. House with direct access to the beach - (30m). Terrace with sea view. Quiet area close to all amenities. House renovated in 2011/2012 . More information on Homelidays website. 3 Bedroom(s), 2 double bed(s). short stays possibility. Final cleaning : included. Price from 800 € to 2000 €. An excellent location on the bay of La Baule, jewel of the Atlantic coast and legendary seaside resort. 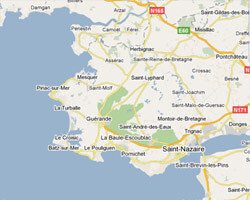 Pornichet station develops over 7 km of coastline with its 2 ports and 3 beaches. 1 Bedroom(s), 2 double bed(s). Final cleaning : 56 €. 3 rooms apartment 60m2. Close to the beach. balcony. Tennis court.